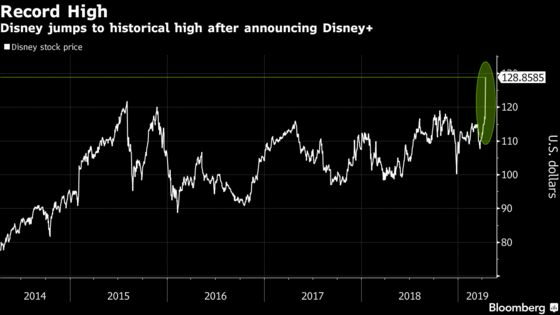 (Bloomberg) -- Walt Disney Co. surged to an all-time high on enthusiasm for its coming Disney+ streaming service. Investors cheered the strategy, sending Disney shares up as much as 11 percent -- the biggest intraday gain since May 2009 -- to a record $129.85 in New York trading Friday. Netflix dropped as much as 2.1 percent. The subscription fee means families could have Netflix and Disney+ for less than $20 a month, a relief to investors who worried whether Disney’s new offering would be able to displace an online service that’s been entrenched in American homes for years. Netflix’s streaming service cost $8 a month in 2011, and the company gradually raised prices once it became a fixture -- a strategy Disney could also pursue. Beyond the price and technology, the new service will live or die based on its content -- and that’s where Disney made a big statement. Disney+ will feature an arsenal of kid-friendly programming, including 13 classic animated movies, 21 Pixar features, original series, and material from its Marvel and Star Wars franchises.